The anticipated launch of the SpaceX rocket, slated for 4:55 a.m eastern time Saturday, was aborted at the last possible second. The snafu almost immediately prompted questions as to whether the private sector is ready to take on the momentous challenges of a space program, although given the big NASA Space Shuttle disasters, that criticism seems a bit premature. SpaceX was co-founded and backed by tech entrepreneur Elon Musk who also co-founded PayPal (s ebay) and Tesla Motors. But, proponents said this is a setback, not a disaster. Computer systems detected a combustion issue in one of the rocket’s nine engines and shut down the mission as the countdown hit zero. 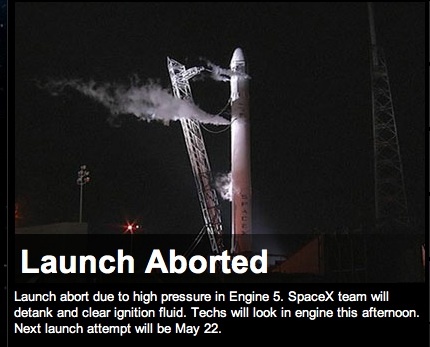 Launch aborted: slightly high combustion chamber pressure on engine 5. Will adjust limits for countdown in a few days. As the U.S. dismantled the space shuttle program, eyes turned to the private sector for funding and know-how to continue space missions. SpaceX’s goal is to ferry cargo and eventually people to the International Space Station. To date such missions have only been accomplished by the U.S., Russia, Europe and Japan. In the U.S. other companies pursuing some aspect of space travel include Blue Origin and Sierra Nevada. And then there’s Richard Branson’s Virgin Galactic, which plans to offer suborbital spaceflights as early as next year. The company is already booking reservations either directly or through its Accredited Space Agents at a mere $200,000 a pop. No bias here; I’m citing news sources from two opposite ends of the political spectrum. And then Musk ousted Eberhard, Eberhard sued Musk, Musk paid off Eberhard, Eberhard settled outside of court, Eberhard started acknowledging Musk as a co-founder, and Eberhard is now completely wiped off the face of Tesla, with Musk installing himself at the center of the Tesla narrative. The fox article is the only one with any depth on the company and is factually inaccurate at that. On top of that neither article really goes into the operations of the company. The articles are both published 2 years before the first car hit production, and even still Elon Musk was already involved in the company, both as the primary investor and the lead designer on the Roadster. That said in 2006 the company probably had around 100 employees and isn’t even close to the company it is now, and likely was in the single digits when Musk came on board as a founder. The vision to take the company to mass market was Musk’s as was the money and friends to make it happen. So while Eberhand had a hand in founding the company it would not be the company it is today without Musk so I think it is fair at this point to say it is Musk’s company that Eberhand helped found, not the other way around.